Amentior: "How my Husband Got Me to Watch Ice Road Truckers"
"How my Husband Got Me to Watch Ice Road Truckers"
MWWPH: "Do you want to watch Ice Road Truckers with me?" MWHFG: "Naw, I'm pretty tired..."
Daughter #1 just asked, "Mom, is that when you were blonde?" 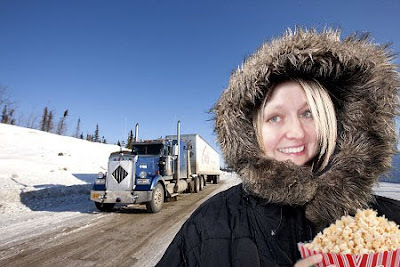 My reply, "Yes, when I used to live in Alaska and eat popcorn on the side of the road."